If the plot to "The Company Men" seems familiar, it's because it's a reflection of the new American Dream, or should I say the new American nightmare. In the past five years or so thousands of Americans, including yours truly, have been crushed under the unforgiving wheels of corporate downsizing. 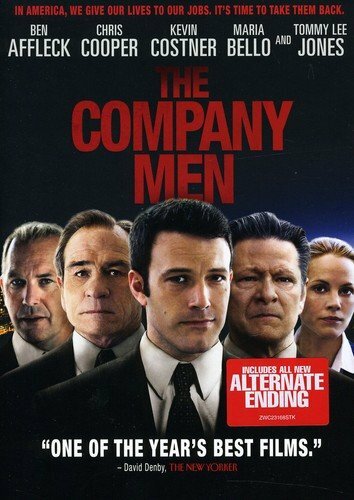 In "The Company Men" unsuspecting, unprepared Bobby Walker (an effective Ben Affleck), a sales hot shot with shipping superstars GTX is one of the latest of many employees to feel the cold steel of the corporate axe. Pretty soon Bobby has "company" at the unemployment center where former six figure execs, secretaries and engineers play card games on laptops to pass the time. Layoffs make their way up the food chain, claiming Phil Woodward (captivating Chris Cooper), a sixty-year old middle-manager who knows his age is a major stumbling block to his ever landing another job. GTS' Vice President, Gene McClary (a terrific Tommy Lee Jones), who founded the company with CEO James Salinger (cool, calculating Craig T. Nelson), wants to save his people as much as the company. He fights against additional layoffs and tries to help Bobby and Phil. When Salinger fires McClary, McClary has enough money to stave off any immediate financial crisis, but finds his own career adrift as he faces the prospect of having no prospects. I felt pangs of familiarity watching Affleck's descent into a financial fiasco because I've been there. It begins with anger...How could they fire me? Then shifts to denial... I'll get another job in three minutes, three months tops -- so why should I watch my spending? Then as three months turned into a year, I cringed watching Bobby fighting self-doubt and the crippling feeling of helplessness as hundreds of his resumes disappeared into the internet ether and went unanswered. Reliving the moment through Bobby when all self-esteem and dignity finally drained from my psyche and I was ready to join the countless unemployed who'd given up looking for jobs, I pulled for him, hoping he could find a position that would allow him to at least get a foot back on the corporate ladder, because if he could rebound, well then maybe I could too. Moments of close to the bone reality abound in "The Company Men": Bobby looking down on his blue collar brother-in-law Jack Dolan (a properly weathered Kevin Costner), only to wind up groveling to him for work; McClary sleeping with the human resources executioner Sally Wilcox (a bit too mellow Maria Bello), only to find out she's gutting his department; and Phil's exasperation when he's told he's too overqualified to deliver pizzas. Cheers to Ben Affleck's for his portrayal of Bobby Walker. At first you'll rejoice watching a corporate fat cat getting his comeuppance, but as he struggles to hang onto his worth as a husband, father and human being you'll cheer, and any actor who can make you do that is worth watching. Tommy Lee Jones and Chris Cooper are all purpose actors who can make you believe they're living their roles. Jones excels playing outdoorsy cowboys and Cooper cleans up playing quirky, emotionally cool characters. Having Jones portray the number two man at a billion dollar corporation is a stretch on paper but not on the screen, especially when Jones lets his expressions or the tone of his voice convey McClary's guilt and frustration. Cooper's hangdog visage, jittery attitude, wavering loyalty and black cloud creakiness mark his character as the least likely to adjust to going from the penthouse to the outhouse. You can sense Phil's fate as he slides into a whiskey glass for comfort or throws rocks at the corporate headquarters' windows, but Cooper rises through his telegraphed storyline, delivering his lines like a tired racehorse who knows he's on his way to the glue factory: "You know the worst part? The world didn't stop. The newspapers came every morning, automatic sprinkler shuts off at six and the guy next door still washes his car every Sunday. My life ended and nobody cared." As Maggie Walker, Bobby's wife, Rosemarie DeWitt takes a cliché, the stand-by-her-man spouse, and turns her character into a memorable, watchable force of nature. Maggie recognizes Bobby's stages of denial and becomes his rock, taking on extra hours at work, balancing the family budget, cutting back on luxuries - bye, bye Porsche, let's take a mulligan on that golf membership and let's think about moving in with your Mom and Dad. Maggie injects Bobby with confidence and faith without having to grandstand or make flowery speeches accompanied by orchestras; she's real, as is the chemistry between them. DeWitt is de-lightful. Her only demerit is her amateurish "pock-da-cah" Boston accent, which appears and fades seemingly at will. I've been waiting for Kevin Costner to make amends for "Waterworld," "The Postman" and his disappointing account of Wyatt Earp's adventures that seemed to last longer than Earp's eighty years. The role of Jack Dolan, Bobby's beefy, blustery brother-in-law gives him a chance to minimize the damage. Costner is comfortable playing a dumb-as-a-ten-penny nail, classless contractor who hides his concern for Bobby behind callous comments about his carpentry. A future as a character actor awaits you, Kev. If there's a villain in the piece it's Craig T. Nelson's Salinger. Salinger offers up the same blameless excuses every short-sighted boss trying to save their own keister uses to justify wiping out people's lives: "Hey they got a paycheck," or "We had to make sacrifices to save the company." Nelson's character isn't heartless, just clueless, even throwing McClary, his ex-college roommate and best friend under the bus. He's a corporate version of Don Corleone -- its nuthin' personal, "just business." The value of "The Company Men" is enhanced by commentary from director John Wells, deleted scenes, an alternate ending and a "making of" documentary, featuring factoids from Wells and the cast. Affleck has plenty effect in his segments, praising his co-stars. Talking about Cooper, he says, "He's never forced, he's honest as an actor and a person." He beams proudly over DeWitt's portrayal of Maggie: "She brings a natural ease and grace to the role". He's also at ease as the film's philosopher, stating: "Being laid off is like being killed," and "What do you do when everything you relied that tells you you were someone important gets taken away from you?" May you never have to keep company with men or women fighting off their creditors or fighting each other for menial tasks offering minimum wage. For those of us that have, "The Company Men" is an all too accurate portrayal of our lives as financial and emotional piñatas. For those of you still able to make your mortgage payments, send your kids to private school or drive a non-smoke belching car with fewer than 100,000 miles on it, let "The Company of Men" serve as a warning. Embrace it, learn from it and keep an eye out, because something might be gaining on you - you could be next.